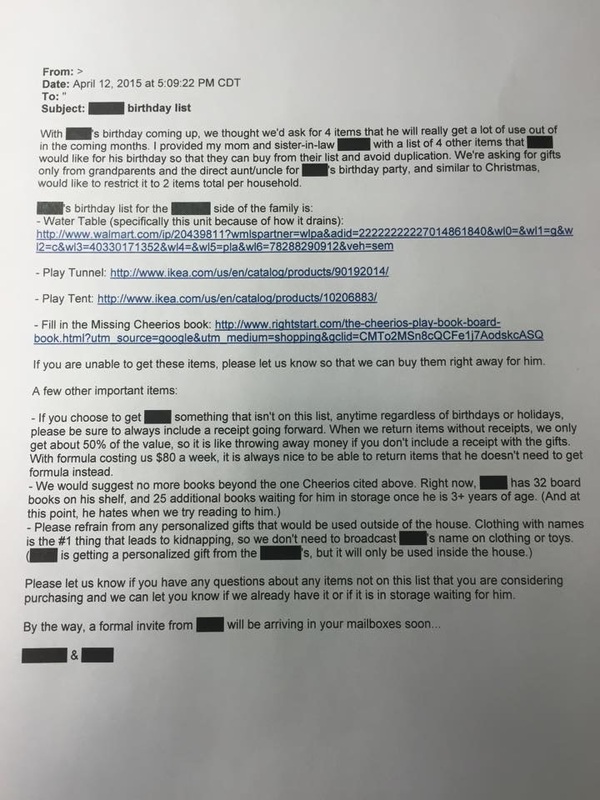 Reddit user Razz32‘s work colleague received it from a family with a “very significant income” – not that it’d be any less rude if they weren’t well off. It just adds insult to injury. The bit that demands a specific water table “because of how it drains.” That’s not suggesting a present your child would like, that’s going shopping with someone else’s money. “Always be sure to include a receipt going forward” (As if “going forward” in a non-work email isn’t bad enough…) because “When we return items without receipts, we only get about 50% of the value, so it is like throwing away money if you don’t include a receipt with the gifts.” I’d venture to say that buying presents for this family at all is throwing your money away, because they’re unashamedly going right back to the shop – ostensibly so the family can buy formula – which begs the question, how old even is this child with his 57 books? Long live the internet, and the endless parade of other people’s rudeness to keep us distracted from our own lives.